After last week’s shocking ending, this week’s episode begins with Petronella waking up after being drugged by Marin. Marin attempts to be kind to Petronella, but she’s having none of it. Then, Marin attempts to guilt her by reminding her that Johannes would be put to death if the church found about his homosexuality. Other than more secrets being revealed, two themes run through this episode: Petronella realizes that she’s now in control, and, it’s a bad time to be a pet in the Brandt house! Petronella lets her parakeet fly free through the house. She then immediately takes on an air of control and maturity we didn’t see in the first episode. She now realizes that she runs the house. Johannes even puts his sister Marin in her place by reminding her that the house is Petronella’s and that she’s in charge. Cornelia, perhaps sensing the shifting power in the house, gives Petronella the goods on Marin. It seems that Marin was in love with Frans Meermans, but Johannes forbid her to marry him. He instead married Agnes. Frans and Agnes own the warehouse full of sugar that Johannes is supposed to sell for them. Now, to the Brandt pets. Someone leaves a window open (intentionally?) and Petronella’s parakeet flies away. Then, Jack Phillips just walks into the house and demands to see Johannes, who, of course, is away on business to Florence, Italy, attempting to sell some of the Meermans’ sugar. Jack says some things that make it obvious that he and Johannes had an intimate relationship at one time. Jack pulls a knife and the family dog attempts to protect the Brandt’s. Unfortunately, Jack stabs the poor dog in the head, killing it (humans 2, pets 0). Luckily Otto arrives and proves that Jack is no match for him. He shoves Jack into a wall and stabs Jack with his own knife. Jack pulls out the knife and runs away. The demise of the pets makes one think that they are metaphors for how the innocent are caught in the crossfire of all the lies flying through the Brandt house. And the sugar is a metaphor for…well, something? I’m sure it will come back up later. 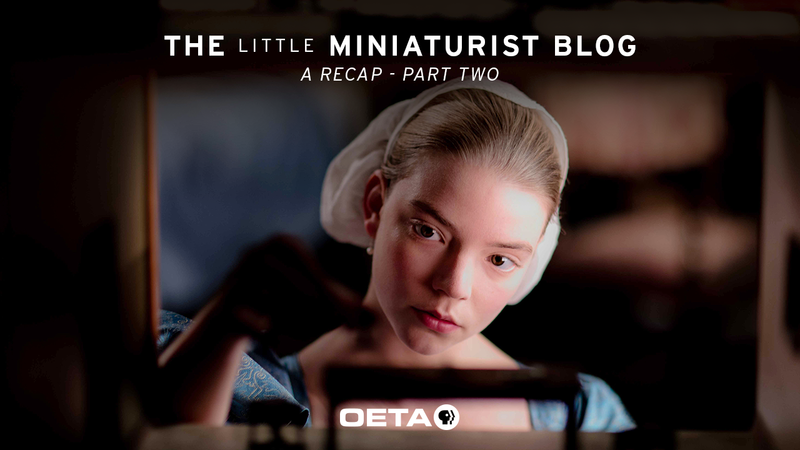 In this episode, the mystery woman and the miniaturist take a backseat to the intrigue and action going on in the Brandt house. Petronella does receive a package that contains dolls of Cornelia, Otto, Jack and the Meermans, Frans and Agnes. The Agnes doll is even holding a small cone of sugar. But, this episode does take an almost supernatural leap when the figures in the doll house begin to move and change, as if on their own. For example, Petronella finds the Jack doll and the doll of the family dog in the doll house in the same room where the dog was killed. And the doll of the dog has red paint on its head. Also, when Petronella goes to the miniaturist’s shop with an order, she sees what looks like Agnes and the mystery woman laughing together through the shop window. Then, the thing the Brandt’s feared finally happens, Frans arrives and says that his sugar is being left to rot in the warehouse and that he saw Johannes and Jack together and he’s going to tell everyone. It appears that Frans hates Johannes for not allowing him to marry Marin and Agnes hates Marin because she’s who Frans really wanted to marry. When Johannes arrives they tell him he has to leave at once. Petronella askes Johannes to take her with him. He tells her that his sister and the house staff need her, which actually sounds like a really lame excuse. Johannes leaves and things calm down for a bit. But then, Petronella hears Marin crying from inside her room. She enters to find Marin about to commit suicide. She stops her and then, a sobbing Marin lifts her clothes to show that she is pregnant! Say what you want about this show, but boy howdy, do they know how to deliver some shocking endings! The series continues with the final episode, 8 p.m., Sunday, Sept. 23.